The day after a birthday is never good. 32, incidently. I didn’t mind 30 or 31. This one just feels different; as there is a checklist as to what I should have achieved by this point. If my life was to be measured by the Disney Scale of loveliness (and general bollywood standards of doing what you are supposed in relation to cultural normals and behaviours), I am failing on not having two kids and a significant other. So trying not be to be a grumpy sour puss old woman today, and reflecting-on balance-on what I have done so far. It snowed this morning. I actually leapt out of bed having been informed of that fact by my sister, and pulled back the curtains. I swore. The plan was to sink the last of spuds and some experimental onion sets. This did not bode well, there had been little time for the allotment to dry out this week. Given how it is the middle of April, I should know better than to discount April Showers. Thankfully, the snow subsided. There had been big fluffy flakes of snow falling onto the garden like feathers. Somewhat unexpected, though friends in the northern climbs had already been bracing for impact. Plus I had some how avoided watching the weather. This meant that normal service could be resumed. Having filled raised beds earlier this week, the final lot of potatoes could be sunk. The last remaining bag was of Pink Fir Apple. These have already been split with Mum, who has sunk some in the open ground of her newly acquired half plot. I guess we can do something of an experiment. 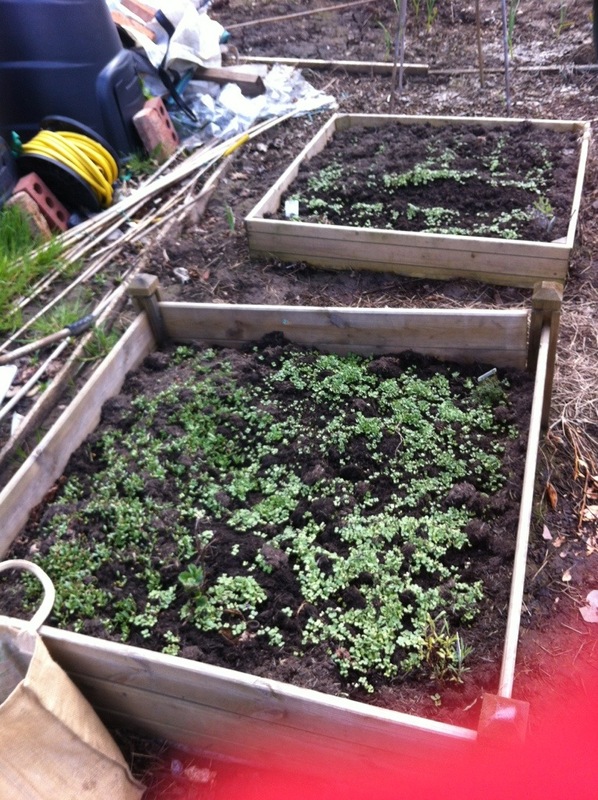 We can observe the possible differences in raised beds and open ground. Whilst her plot has rather friable soil, mine is heavy, sticky clay. For this reason, I have learned to not plant my potatoes in open ground. The other thing to do was to sink onions. I haven’t done this for a long time, as I don’t tend to garner much success with the sets. I have previously sown sets in autumn and in spring, with the resultant crop being quite small. There was definite poor results with red onions, so I have always been a bit wary. 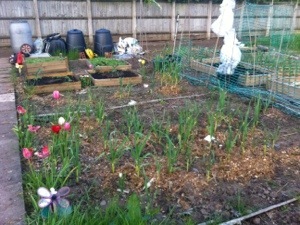 However, as Mum was intent on sowing onions and asked for me to find some; I don’t mind another go. As for 32. I don’t really want to dwell on it; but it will take time to let go. The bullish amongst us will naturally just shrug their shoulders and say that it is just a number. That is true, the next one is 33 and doesn’t-at this stage-look or feel scary. I think I looked at it yesterday morning as being half way to my pension (it’s not worth a lot, unfortunately). Then again, that age changes with the frequency of an elected government. Anyway, the spuds are planted. 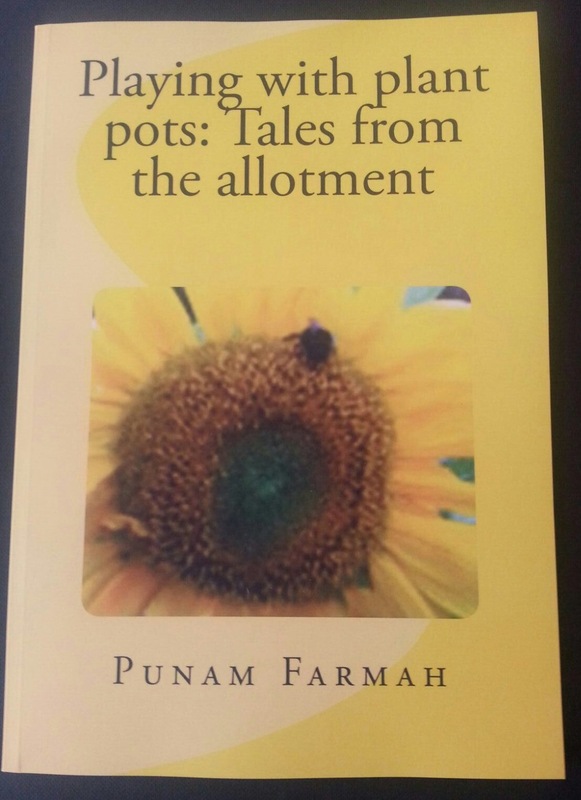 There are squashes to be sown. 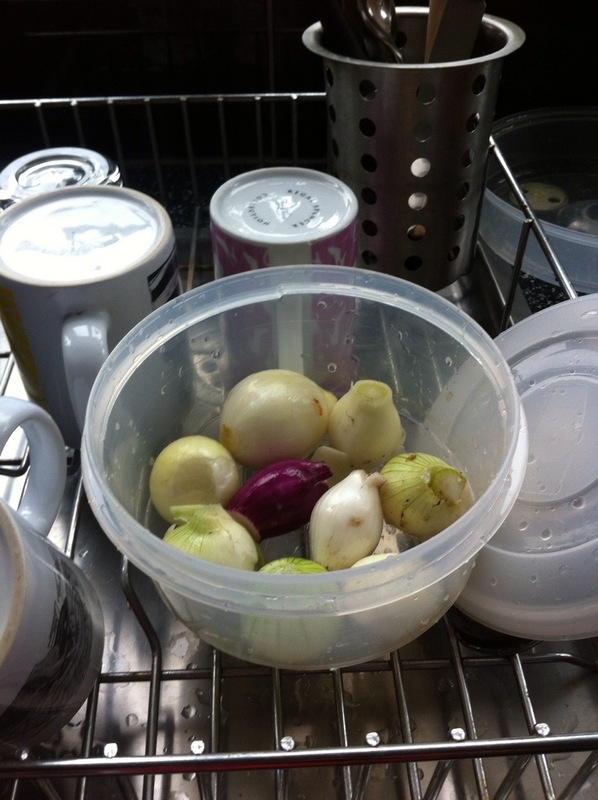 Yesterday, I harvested four small onions for the aubergine and mint chutney. Back again today as some more are needed for currying lamb chops. There are even some red ones ones in there. As ever, limited success with these red ones. Ma reckons that there is about two or three full size onions worth here. Will be used with some home made garlic. Over the last few days, there has been a brief window of respite from the deluge of rain that the British Isles has been experiencing. The volume of precipitation has reduced some what, and the sun-yes, the sun-has even made an an appearance or two. With that, the puddles have started to dissipate! woo-hoo! The plot is still damp, yes, there has been alot of water. But the puddles that had been there have in fact gone. I can see clearly low the dips, and a few of the onions and shallots that were planted in the late autumn. A few of the flooded parts have sent up a few shoots, but not many. Shallots are only just sending up clumps of shoots. 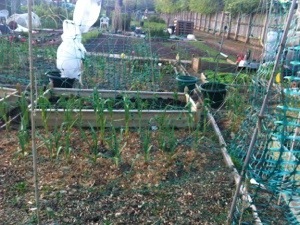 One of my site neighbours does believe that the onions, shallots and garlic will recover. Her logic being that the plot has been under a foot of water before, and the onions et cetra still came off. We shall see! The garlic doesn’t seem to be doing too badly, a little wind burned, but still there. The red onions are most likely a write off. 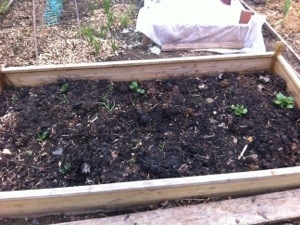 As are the broad beans that were sown. Both of these could be resown, but this drying up of ground does present me with the opportunity to perhaps sink potatoes there instead. Broadbeans could be sown else where further down on the plot, rather than on the project othello section. Have never had much success with spuds in open ground, so this could be the plausible window to do so. At least now, Ma doesn’t have to have any broadbeans. It is now easier to see where wig wams could also be positioned. Once the plot gets drier, I can assess all the seven open ground beds on project othello. The doom and gloom is lifting, the whole plot seems lighter, and there were even some crocuses come through. As well what looked like daffodils and tulips. Over the last two weeks, it has been rather difficult to walk down to the plot. Mainly as the weather has been atrocious, but also as I start a new post. The sum of any visits has been to wander down there in the red wellingtons and see if the puddles have got any deeper. One takes one’s life into one’s hands just getting down the path. Sadly, there is no money in the site budget to fix it. 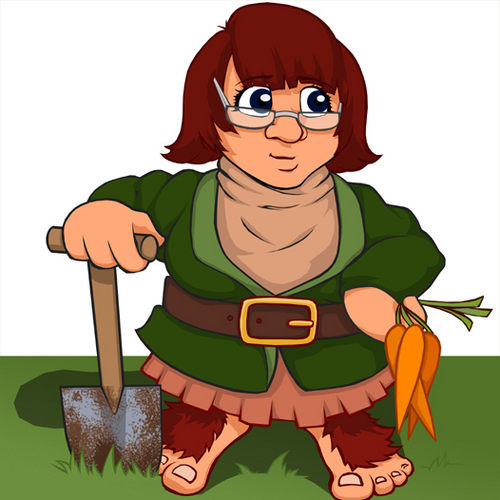 I grumbled about that a fair bit at the plot meeting. It is turning into a health and safety hazard. The plot itself, is a maze of puddles; as you will see from the videos. Which is why there are so many raised beds. The benefit of the rain, is that I can see where I need to build things up. The plot is actually lower than the path that runs alongside. The plot cuts something of a post-apocalyptic scene in the desolate dire winter. A stark contrast to the flourishing flowering scene in the summer gone. I must remember to sow the sunflowers for the Sunflower project 2014. 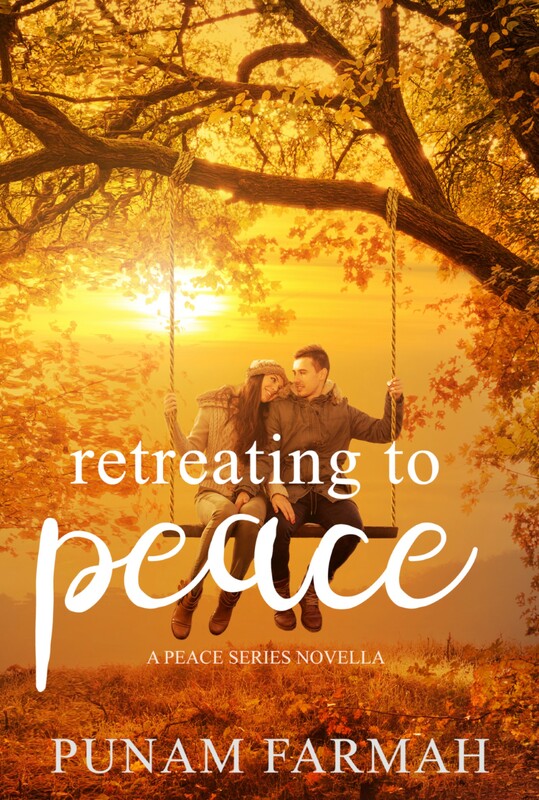 I encourage to think about that, a good cause and it makes the plot look oh so pretty! I know that the for the last few weeks, all the updates have been somewhat miserable. Sadly, I cannot control the weather! The growing season is still in it’s infancy. Took a walk down to plot 2 today. Wanted to update you all on just what was happening. Very cold, but very bright. Just not very playable though. Bit of sunshine, lots of puddles. So much to clear up. I have battled with the topography of the plot. It is lower in the middle, than everywhere else. Water forms puddles, that then just stand and stay there stagnating. 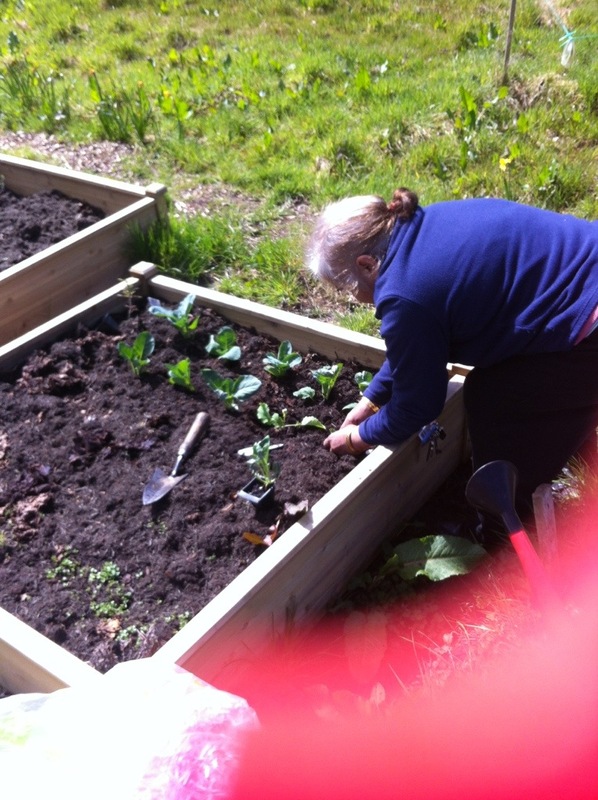 The key has been raised beds. I can safely say, that they have been very useful. Allowed me to get growing, and be successful with it. last year, three beds were full of potatoes. The spuds worked reasonably well, I got potatoes, that was good enough for me. However, there was a lot slug damage to them. 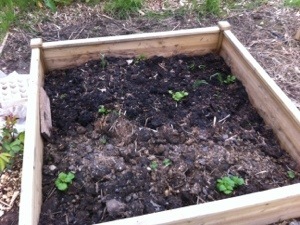 The beds were filled with assorted organic matter. Grass cuttings, horse poop, and leaf mold. This year, the beds have sunk; as they do. So will need to have more material added to them. There are onions, shallots and garlic in there somewhere. These were all planted through cardboard. I would have expected to see a bit more top growth by now, but these were planted a whole month later than expected. In addition, there has been a lot of rain. I can only hypothesis that the roots are being set down, at least by those sets that have survived the wet and inclement weather. Leaf mold! This was all collected last year, and is cooking in the cold. There are two aims for this stuff. To first use in the raised beds, and there are quite a few raised beds. Then to put what remains where I can, to improve the soil and help raise the open ground areas. Last year, one entire builders bag was used to fill a 1mx2m bed. This bed was then used to cultivate two courgettes and marrows. I can safely say, that the decaying matter did them wonders. Prolific anyway, the squashes somewhat thrived with all that leaf mold. 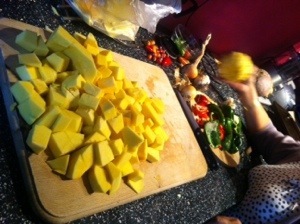 Have chopped up all the veg. Roast in the oven-happening right now-45mins on has mark 7ish. Heat roasting dish with olive oil. Adds cumin fennel and chilli seeds when hot enough. 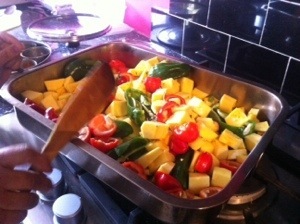 Add veg and put in oven. Then fry off onions and garlic in dash of oil. 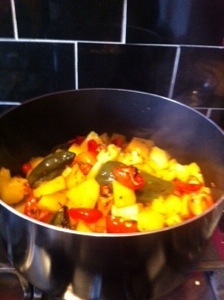 Add roaster veg with salt, pepper and garam masala with stock. 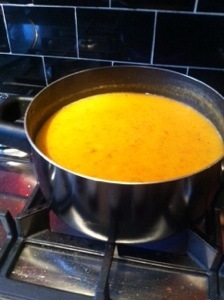 Simmer till soft and then blitz with hand blender. That’s the plan at least! Sown in the classroom, were some leeks and onions. Today, these were moved to the Wendy house. Purely as they were looking a little unloved. Sadly, I don’t get to talk to a lot these days. The babies are starting to lol over a bit. These are a second sowing of leeks. Onions have never been sown before, so are an experiment. Stashed in the Wendy house, I am hoping to sow more onions. Not many have come through; which is disappointing. I am yet to be convinced about the b*ng for buck, when it comes to shallots. I must have sunk dozens over both the autumn period for over wintering, and then quite a few in the spring. This is my third, fourth year of growing them; and I am erring towards the not sure, should I really bother? The tray of shallots has been sat in the Wendy house since they were lifted and drying therefore for a while. Waiting, as I tried to work out what to do with them. Did a bit of research as to how they could be preserved and pickled. Traditionalists would have brined the shallots first, so as to retain the crunchiness. That’s fine, I just didn’t, in this case. I was wary, that whilst I had two jars. There wouldn’t be enough shallots to fill them both. The jars were sterilised-kept damp and then stuck into the microwave for a minute or so-and then shallots put into one of them. On the outside, shallots are not particularly attractive. Look like diminutive, wrinkly, tan coloured onions. Only when you remove the peel, do you get this fleshy pink creature beneath. I sat there for a good half a hour-tears streaming, no one had informed me of their eye watering nature-before Mama H took pity on me and sat down next to me. Decided that she could help, and peeled the baby onions. Onions. That’s another thing. I have never known such a small sized harvest. Again, I despair. Hundreds and hundreds were planted. In the gallery, they do seem to be the same sized as shop bought pickled onions. These were put into both of the jars. The jars were still not looking full. Next came the garlic. A bit of a last minute idea. I rather like pickled garlic, one of those things you get in a certain Portuguese restaurant with olives, so why not have a go. Raided the four tier blowaway, where the garlic has been drying. 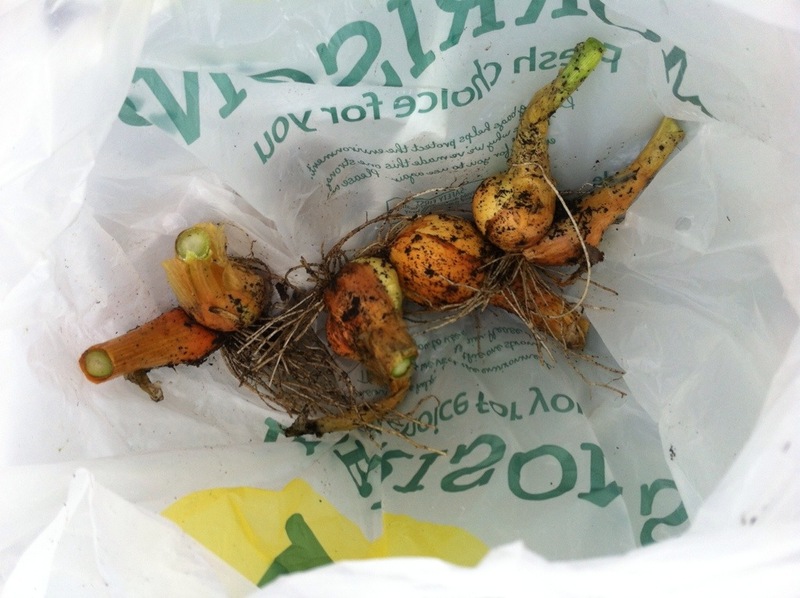 Retrieved about five large fleshy white bulbs. Again, Mama H took the lead, and peeled them as I was going far too slow for her liking. The garlic will most likely take some time to become pickled. The combination of these was probably not a good idea. Alas, we shall see what happens. The next thing that may well be pickled will be the jalapenos and chillies that are in the Wendy. But that is a another story; the things have to grow first! What you see are lady Balfour, kestral and king Edwards. Today, I noted that Sante had come through the clay as though over night. There a number of different onions, shallots and bits of garlic. With the heralding of the May Day bank Holiday, you would have been forgiven this morning for being bah humbug as the heavens opened. Everytime I went to even think about putting my wellies on, the heavens opened. It was noon before the threat of rain dissipated. Having spent over a week away, this was an opportune time to see how the land lay as Mama H had been watering in my absence. I have also resisted, in clearing my window sills. Aunty Tish and net them. There was also a Sunderland Kale that needed to be put out too.So mama H did that as I was charged with watering things. As you can see, lots of fenugreek and various spinach like seedlings are germinating in a carpet of green. Looking good there. With being charged with the watering, if did so. The potatoes are still asleep, no green shoots there yet. There is still a threat of frost. Frost, that hopefully will leave the blossoming Concorde tree alone. 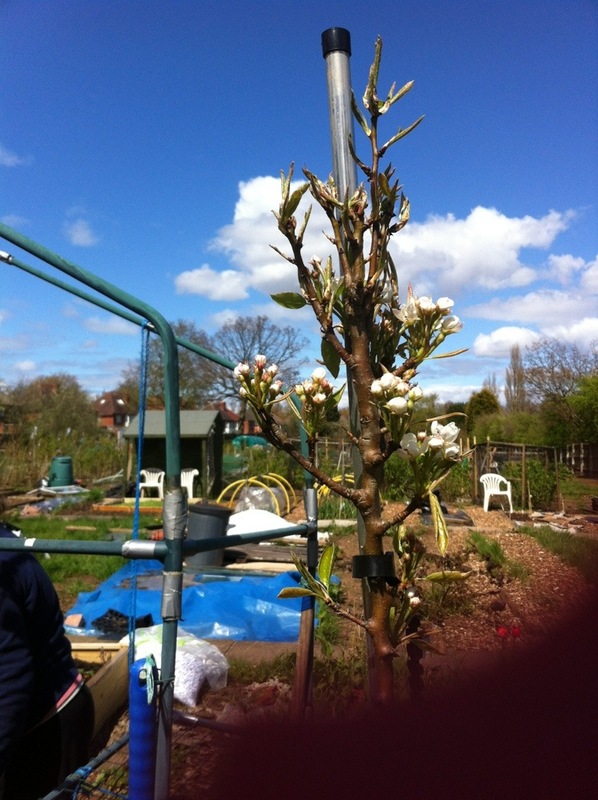 Last year, this was the one tree that stood there sulking; with the apple and plum flowering and fruiting. Something positive to take note of there. Carrying out a couple of experiment, early direct sow. Dwarf French beans. Varieties sown were purple queen and borlotto dwarf. These are somewhat speculative, as we only just into may. 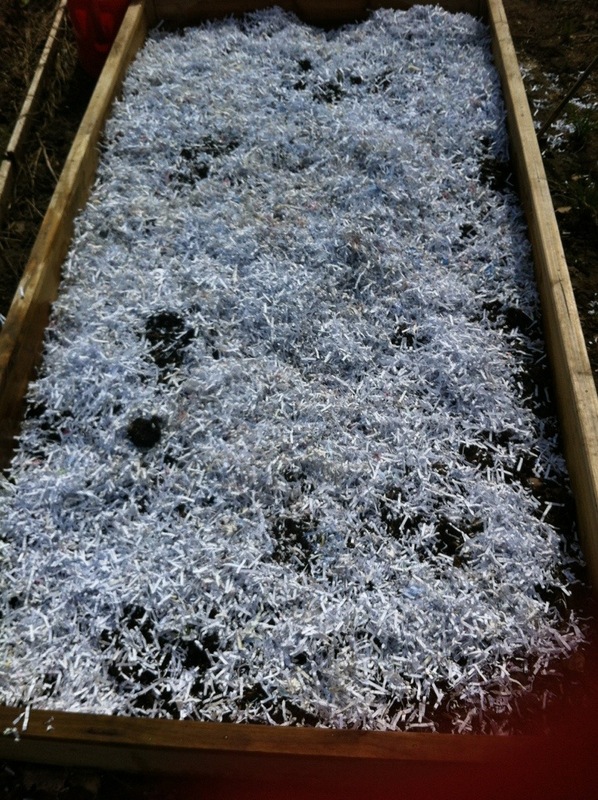 The other experiment, is the laying of shredded paper as a mulch on a potato bed. That one is for further observation. The Garlic, looks lovely! As do shallots. They in particular seem to have bloomed out of nowhere. Looking fairly sorry for themselves, they have taken on a whole new look for themselves. 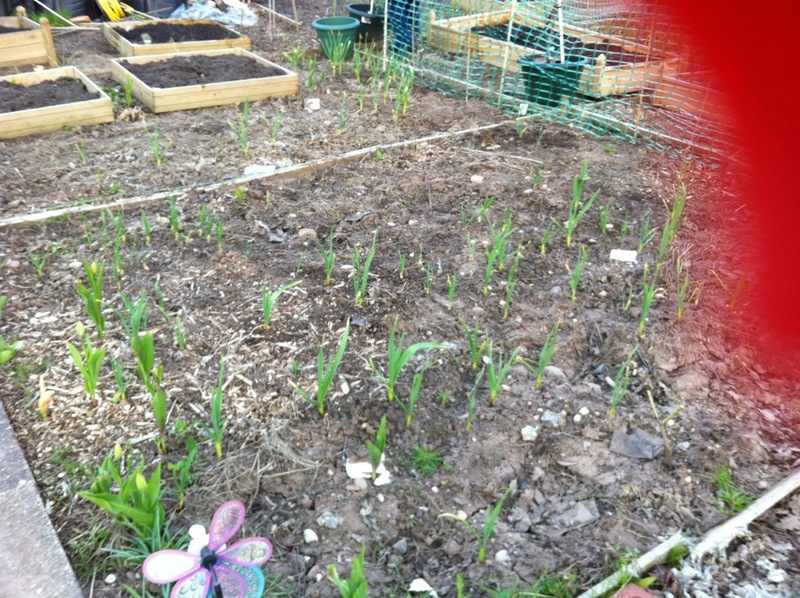 Some of the spring planted garlic is starting to send out some green shoots as are the onions. These were all mulched today, I really don’t fancy the weeds that have started to pop up. Finally a few splashes of colour. 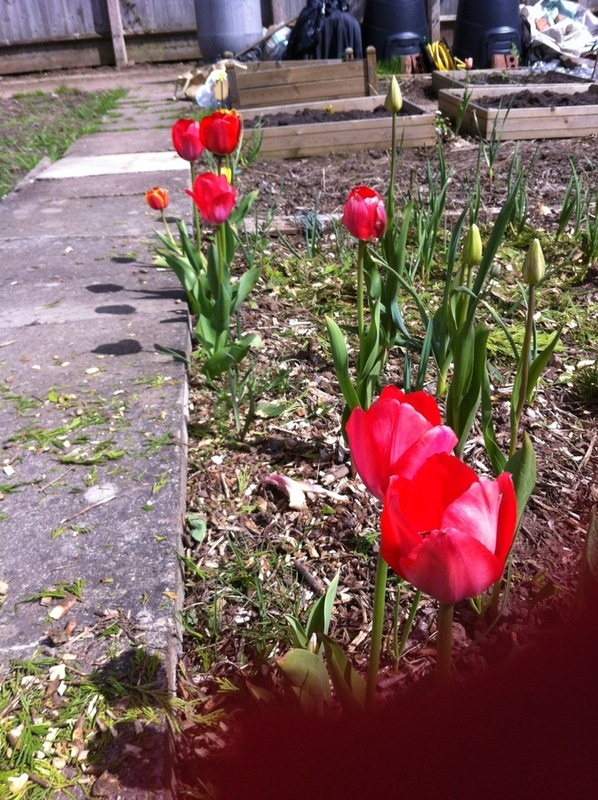 Not as many as last year, but the tulips are blooming and looking lovely. More anemones were sunk today; whilst racked with pansy envy. There are no survivors on the plot, but at home we have about five or six that were pinched by Ma and put in pots. Providing a burst of red, white and purple. So much to do. Really would have wanted to plant out a couple of squashes. Might try with a couple later this week. Another experiment…. Have a lovely may bank holiday where ever you find yourselves. The slightest bit of sun; and you know about it. Mama H and I took an evening walk down to the plot to water the newly broadcast sown seeds. And in doing so, I observed just how sentry like the various bits of Garlic and onions were doing. 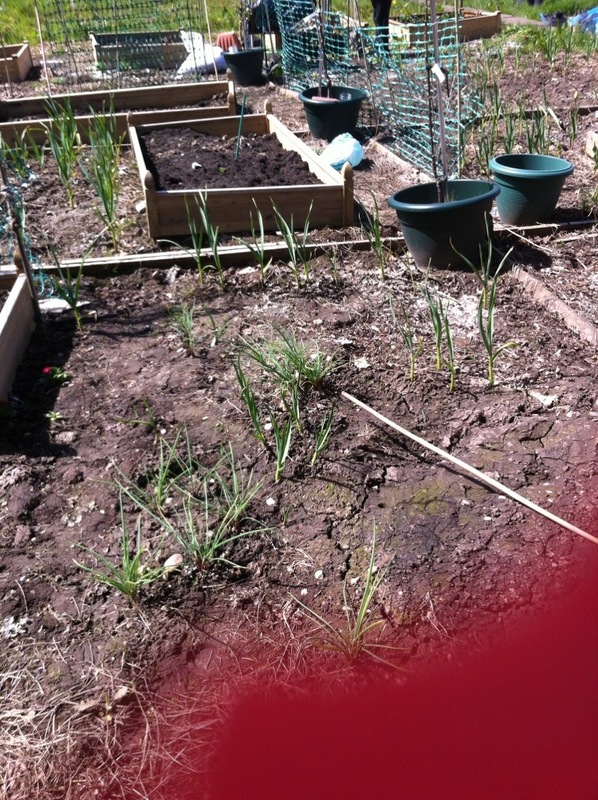 Even the leeks sown in classroom, appear to have taken on a new vigorous approach in basking in the sunshine. The baby leeks have fattened up quite a bit in a matter of a few days. They are yet to be pencil thick, but they are not as wiry as they were. It is the allieums on the plot that make me feel more positive. No longer stood as though they are sulking, but all very sentry like; garlic, onions and shallots that have been looking very miserable, look all very green and resplendent. A touch windburned perhaps, but after all the miserable moodiness of autumn and winter there is a light at the end of the tunnel. Remains to be seen how big a crop it will be, but it does look nice. On the window sill, germination is happening at a remarkable pace. Three cucumber babies have appeared. Perhaps more. But femspot and crystal lemon have raised their heads from the modular cells. A yellow scallop squash is threatening to break out, as is a Avalon squash seed. The last of chilli seeds are being closely monitored; it will have been a month since sowing, and over a third of the seeds sown have come through. That is a lot of chillies.